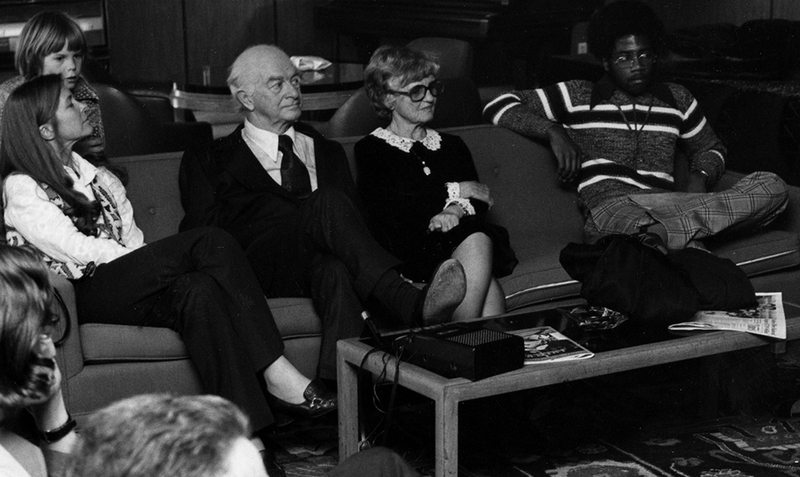 Former LA mayor Tom Bradley (far right) with students in the Winnett Center. Edward Teller with students in the Winnett Center. Winnett Center in the 1960s. The Winnett Student Center has been a campus landmark for more than 50 years. But, this summer, the Italianate building—home to the Red Door Café, the Caltech Store, the ticket office, and a recording studio (as well as sundry meeting spaces)—is being demolished to make room for a new campus hub. The new Hameetman Center —named in honor of Caltech trustee Fred Hameetman (BS '62) and his wife, Joyce—is scheduled to open in fall 2018. Of course, Winnett itself is only the latest in a long line of campus hubs that have come and gone on this same site. Here's a look at its history … and a quick glimpse into its future. On the site where the Hameetman Center will rise once stood a building known as the Old Dorm, which itself began life a mile or so across town. Built at 289 North Los Robles Ave. in 1910 as a dormitory for the original Throop Polytechnic Institute, the Old Dorm was designed by noted architects Myron Hunt and Elmer Grey, also responsible for designing the current campus's first building, Throop Hall (no longer standing). 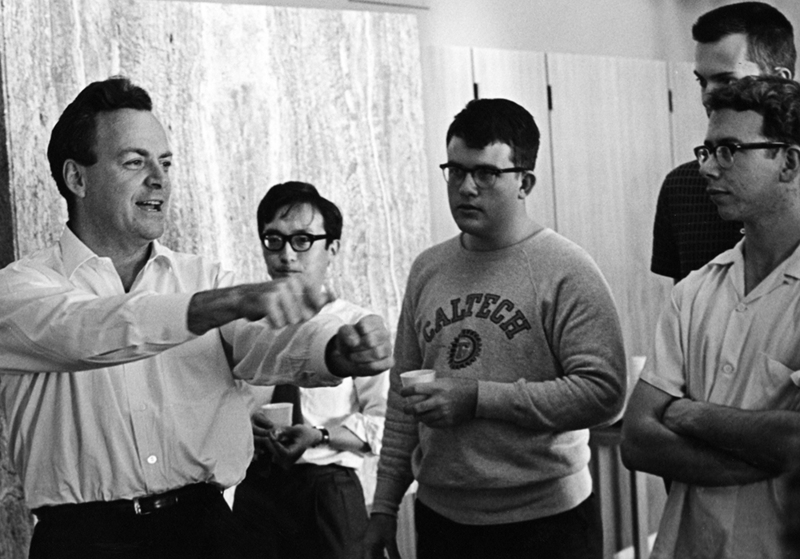 The Institute spent $150 to have the Old Dorm cut into seven sections and moved southeast to the current Caltech campus, where it served for 15 years as the Institute's only student residence, with rooms for 60 undergrads. The 1916 Caltech Catalog described "a modern dormitory of California bungalow type, two stories in height, with large, airy and well lighted rooms for about sixty students—and with attractive dining room, living room and recreation rooms." The Old Dorm also boasted a lunchroom known as "the Greasy Spoon" (or, simply, "the Greasy"). Up until then, faculty and students had brought lunch to campus, picking up ice cream, candy, and soda from a portable stand where GALCIT now sits. "With the advent of the 'Greasy Spoon,'" noted a Caltech press release at the time, "deluxe dinners were available, soup to nuts, for $.30, including seconds." 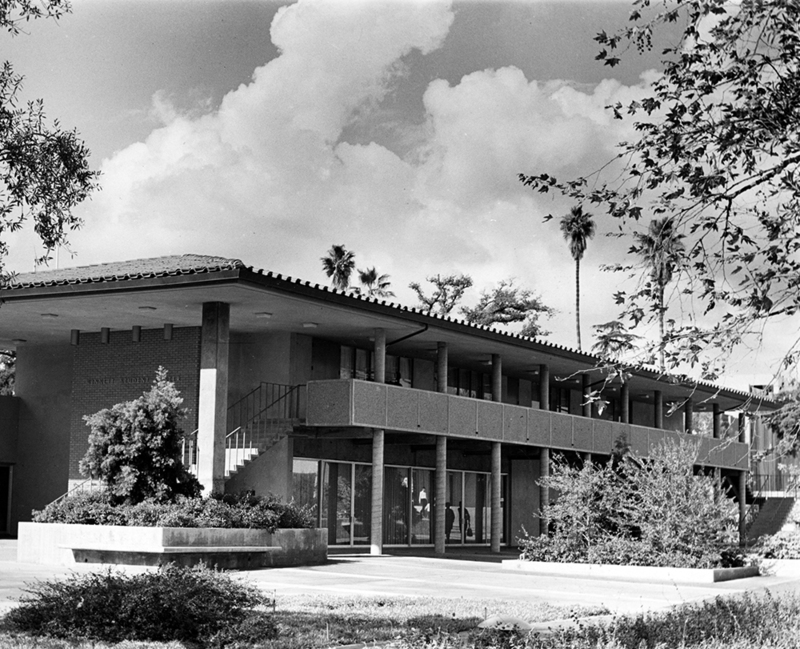 A student center was built next to the Old Dorm, designed by Pasadena architectural legend Henry Greene, and named "the Dugout" in memory of a popular campus sandwich shop. The building's focal point was surely its unique fireplace, built with the proceeds of a fundraiser in which engraved bricks were offered for a dollar apiece. The fireplace was composed of 376 bricks bearing students' names, with another 22 engraved by clubs and other donors. Forty years later, the fireplace wall was preserved and integrated into the design of Winnett—and will be preserved as the site morphs again into the Hameetman Center. A major remodeling of the Dugout took place, and with it came a new name: the Throop Club. The 1935 Big T described how the new space was celebrated with a party "in which heavy gambling and equally heavy doughnut and cider inhaling figured prominently." The Winnett student lounge in the 1960s. A press release put out to announce the Old Dorm's demolition invited community members to a "wake for one of the oldest members of the California Institute of Technology" and said of the dorm, "Could its walls but speak, they could tell of the young and hesitant feet, many of them now world famous, that have moved over the uneven boards of the floor." The Winnett Student Center opened, funded by Pasadena resident P. G. Winnett, board chairman of Bullock’s department store and a Caltech trustee from 1939 to 1968. The center was enlarged and renovated in 1998. A generous gift from Fred and Joyce Hameetman initiated the design to replace the current facility. The focus of the new Hameetman Center will be on versatility and functionality, and the building will include a rehearsal hall for Caltech's music programs, thanks to a gift from emeritus professor of theoretical physics Steven Frautschi and his wife, Mie. "With this new structure," says Vice President for Student Affairs Joe Shepherd, "we will be able to remedy the many limitations of Winnett to provide an attractive and inviting community gathering center as well as provide much needed rehearsal space for our very popular music programs."